I was lucky enough to have a weekend away in Edinburgh with J this weekend. I actually had the best time, good food and sightseeing is a pretty perfect way to spend a 5 year anniversary. Armed with several restaurant recommendations we actually chose our first restaurant due to its vicinity to our apartment (flurries of snow were coming down and it was too cold to venture too far). Well, the snow was actually a bit of luck as it resulted in one of the most delicious meals I had eaten in a long time. My mouth is watering just remembering it. 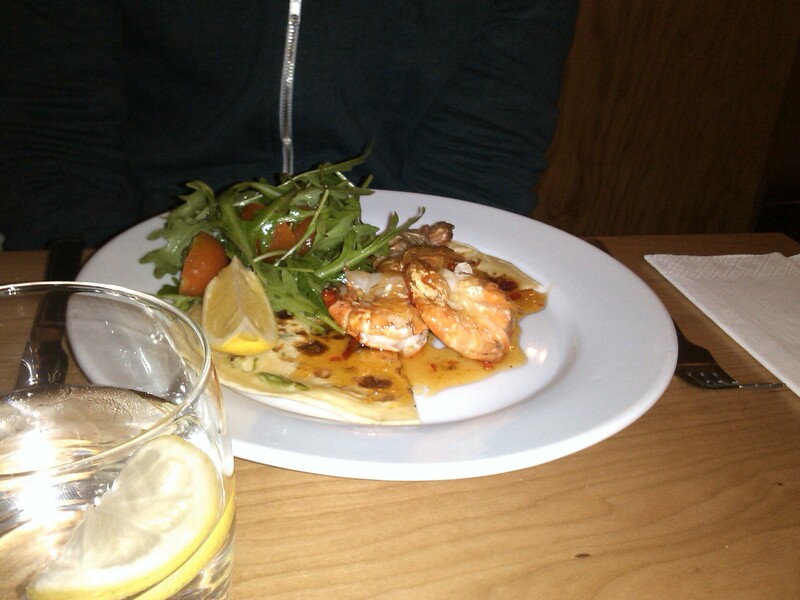 We went to Mussel and Steak bar which is in the Grassmarket area of the city. We spent a fair while deciding what to pick off the menu as it all looked so tempting. 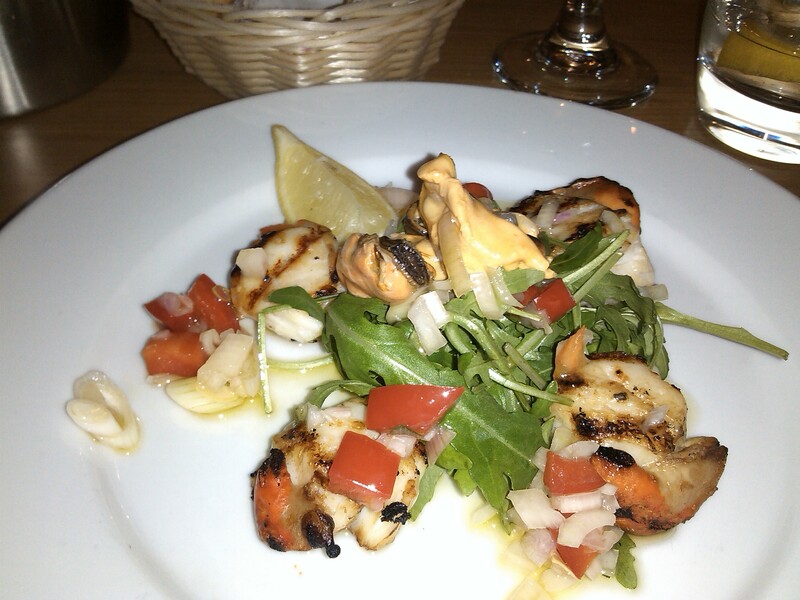 I started with griddled scallops from the daily specials. Now after 6 hours on various trains in was a pretty spectacular first meal. I would have have considered griddling scallops but it added a pleasant charred sort of flavour to the mix. I’ve never eaten pickled mussels before and they were a nice addition to the dish. Scallops, don’t mind if I do! For my main course I had surf and turf. I think this was my favourite thing to eat from the whole weekend. If you love steak and also shellfish you can’t really go wrong with this. The steak was beautiful and cooked just how I asked for it (rare), the mussels in their chilli sauce were a treat, the prawns were flavoursome and juicy and the squid was tender. Squid is something that can often be overcooked and go rubbery but I have noticed that more places seem to get it right and the squid here was perfect. 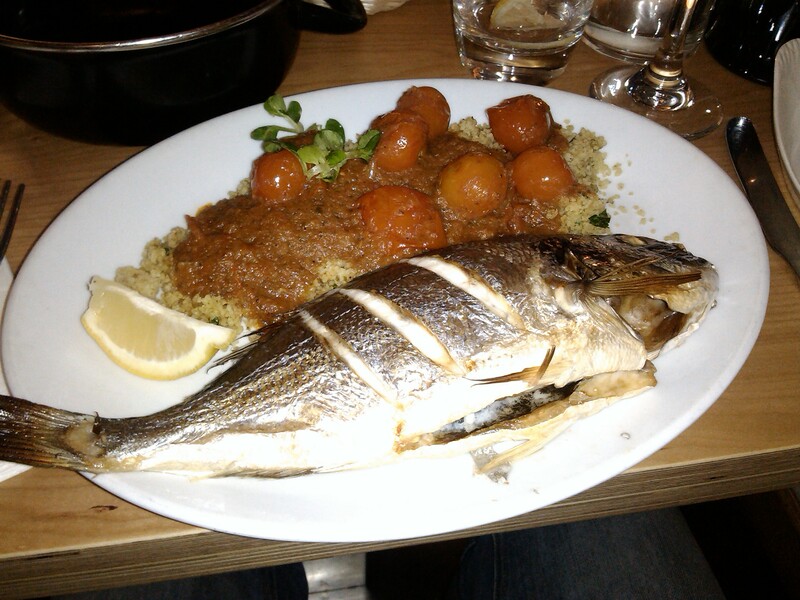 J had sea bream with Moroccan spiced cous cous from the specials. Now the cous cous might not look like much, but J absolutely adored it. He said it was delicious. The bream was cooked perfectly. Crispy skin and tender flesh. We had sides of salad and bread (which we used to mop up the lovely sauces). We also accompanied the meal with white wine. Although the dessert menu was extremely tempting, we decided not to. Sometimes when you seriously overeat it can lessen the enjoyment of a night (besides my waistband was certainly feeling tight, despite cutting round the fat on the steak!). We skipped (or slid) happily back to our little apartment, slightly tipsy of white wine in my case. Next time I visit Edinburgh I definitely want to go back. 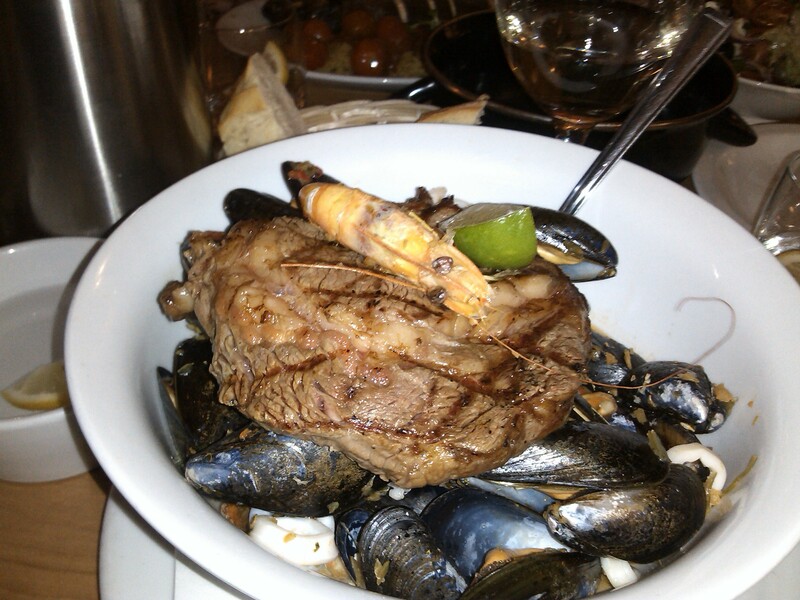 If I could pick a last meal before I died, the surf and turf at Mussel and Steak bar would definitely be a contender. You can find out information on Mussel and Steak bar here. This looks amazing! I’ve never tried surf & turf despite eating huge amounts if seafood and steak! Is it worth trading chips and onion rings for prawns and mussels? In my opinion yes, as much as I love the odd onion ring. But then I am a protein fiend as opposed to a carb fiend. Definitely worth trying at least once. Also, how awesome is the grassmarket? This looks glorious, hope you guys had an amazing weekend! Oh god. Coming from an absolute seafood FIEND, this place looks incredible!